It is good to ask, at certain stages of our life, who we are. It is an opportunity to take stock of oneself, what you are doing, and how you are measuring up to the vision or vocation that you have. Each of us must do this as a person, and we must corporately do it as a body of persons – the Church. In this instance, we are doing it as that local body of the Church that is known as the OCA. Who are we? I teach a class at St. Vladimir’s Seminary called “Orthodox Christian Identity,” and it is a good opportunity to explore some of the things we take for granted about ourselves. We look at how we define “Orthodox” – sometimes in opposition to “the West”, sometimes through external elements such as vestments, sometimes through intricate theological definitions, sometimes through liturgy. And we think about where we would most *want* to see Orthodoxy, in other words, what really matters most about Orthodox Christian identity. And that inevitably comes to: the right knowledge and praise of God, through his Son Jesus Christ and His Holy Spirit – all expressed through a right and loving relationship with people and with the world. In short, it means being a true Christian! If we want to come to the essence of our identity, we want to tease apart the essentials from the non-essentials. But this is not as easy as it sounds. I will take here just one example that has accompanied the entire history of the OCA, namely the “ethnic” question: the OCA has decisively Slavic roots. To what extent should these roots be part of our ongoing life and identity as Orthodox Christians in America? What makes this a complicated question, apart from the crucial pastoral issues (the needs of the people, on the ground), is that the Orthodox Church, and more-so all the local Orthodox churches, are products of history. They are all embedded in cultures. This makes it more difficult to identify some of the “non-essentials.” Some would say that all ethnic trappings are in that category of expendables, but how realistic is that? All theology, and all right-living, is expressed in specific contexts, in specific times and places. Would you strip off the ethnic and cultural trappings of the Gospel narrative? Our Lord spoke in terms that could be understood by farmers and fishermen: sheep, seeds, and nets. He spoke in terms of first-century near-eastern social customs too, and we have to come to know some of those customs if we are to understand his parables. The marks of history – the influence of Greek culture on our theology and our Creed, the influence of Jewish customs on our liturgy – are indelible. We simply do not have theology without them. Likewise, think of the inevitability of Syrian, Slavic, and other cultural vessels – earthen vessels – that carry the treasure of the gospel (see 2 Cor. 4:7). All of this is a long way of saying that when we consider OCA identity and vision, we are right to ask questions of how long, how much, and in what ways our Slavic heritage is to remain a part of who we are. But the centuries of our life in America have shown that they do not have a simple or uniform answer. Perhaps in our day, the question has changed, or is changing in ways that we ought to encourage. 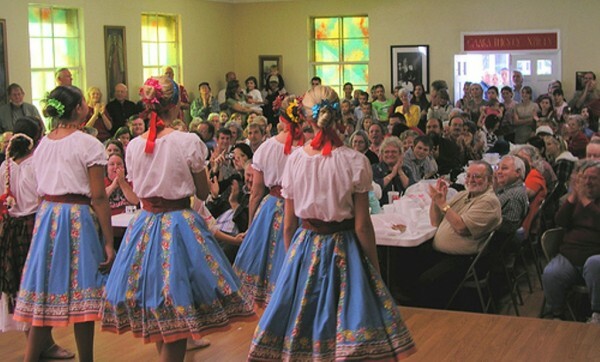 It’s no longer a matter of whether we are Russian, or were Russian; it’s no longer about whether we hold on to the musical, iconographic, liturgical traditions that are particularly Slavic. They’re with us; they are beautiful and time-tested vessels of the Right Praise of God. Even the language issue is slowly dissolving, as more and more parishes rightly adopt the language of the community, which is in most cases English. The question now is about attitude and attachment. Just as the problem with money and riches isn’t the stuff itself – as Luke 18 shows us, it is our attachment to the stuff – so it is with Slavic forms. They can be cherished vehicles, but not idols. In my current parish, where I help direct the choir, we are talking about reintroducing bits of Slavonic, for pastoral reasons. There were times when this would have been seen by some people as a sad retreat to the past; I see it as a healthy and unforced move forward, with the past. “Forward with the past” describe a lot of what Orthodoxy is about. As we pursue a genuine Orthodoxy in our land, it helps to remember that, really, there is no other “American Orthodoxy” than the Orthodoxy that bears its ethnic roots. In fact, what can be more American than a Church with multinational roots? My hope and prayer for the OCA in the 21st century is that it is well on the road to a healthy – detached, free, realistic – relationship with its roots. We had to go through strongly Slavic periods. Then, especially in the lead-up and aftermath of our autocephaly in 1970, we had to be in turmoil about casting off our Slavic identity. Here we are now, in post-modern America. Let’s deal with it as sanely as we can, and let’s always keep our eye on the prize: the right praise of God, stemming from and leading to a God-pleasing life in service to the world. That’s what it’s about. And as we keep our gaze fixed on Our Lord, let’s shun idols wherever we find them. Dr. Peter Bouteneff (SVOTS ’90) teaches courses in theology, patristics, and spirituality at the St. Vladimir’s Seminary, where he is Associate Professor in Systematic Theology and Director of Institutional Assessment. After taking a degree in music in 1983 he lived and worked in Japan, and traveled widely in Asia and Greece. Together with Prof. Nicholas Reeves, he is co-directing the Arvo Pärt Project, an exciting collaboration with the great Estonian Orthodox composer. Tune in to his podcast on Ancient Faith Radio, Sweeter than Honey. This piece first appeared as a publication on the OCA Wonder Blog.